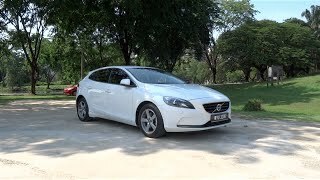 Just a couple of days back Volvo lifted the curtains off its much awaited five-door hatchback, the V40 2013. No the car wasn’t announced officially by the company. Instead a few pictures, specs and videos of the car have been made public by the company. The photos and videos released by Volvo only goes on to confirm what people had been speculating so far about the car. From the pictures, it is quite evident that the car has those typical Scandinavian design features that we so often see in vehicles of that region. Sharper edges with classy look and appearance are just a few features of the 2013 V40. 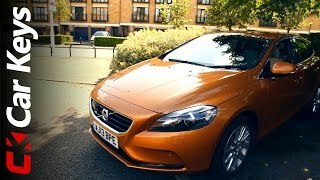 Although the V40 shares the same platform as the Volvo C30 three-door hatch, it does not share even one body panel with that car. This is because that the design of the V40 has been refined by Volvo’s ‘Design Around You’ strategy after it was taken over by Geely, although the main conceptualization of the car was done when Ford was the owner. This strategy brings the focus back to minute detailing and high-tech gadgets. The 2013 V40 will come with a range of engine options, where it would have everything from compact diesel to high-performance turbocharge five-cylinder T5 engines with a max output of 254 HP capable of pushing the car’s speed to 60mph from zero in a matter of just 6.7 seconds. The entire engine range will feature braking energy regeneration and automatic stop start system, irrespective of the transmission of the car. On the inside, the V40 looks real high-tech. Standard features include things like fully graphic personalized instrument layout, leather seats, panoramic glass roof and metal trim elements. It will also have a new version of Volvo’s very own floating central stack. 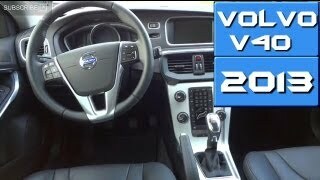 The car also incorporates some impressive safety features which Volvo is well-known for. The 2013 V40 features Volvo’s latest Pedestrian Detection with Full Auto Brake. This system includes world’s first pedestrian airbag which flies out of the bonnet in the event of collision with a pedestrian or a car. Apart from that the V40 comes with Lane Keeping Assist with haptic auto steering. The Park Assist Pilot feature makes parallel parking of cars easy. The 2013 Volvo V40 will debut at the Geneva Motor Show soon and will be launched in the European markets shortly. But sadly the car will not be making it to the US markets and that is because Volvo thinks that US is not really a good market for hatchbacks. Volvo Car Corporation will reveal the all-new Volvo V40 at a press conference at the 2012 Geneva Motor Show on March 6. "The all-new V40 is the first new model that is fully developed according to our human-centric, Designed Around You strategy. Charged with an outstanding set of high-tech features it definitely will give our toughest competitors a headache," says Stefan Jacoby, President and CEO of Volvo Car Corporation. "Thanks to input from customers all over the world our most compact V-range model features an outstanding blend of design, safety and versatility. The car is loaded with features that buyers of modern luxury cars want," explains Stefan Jacoby. The engine range spans everything from Volvo Car Corporation's first diesel with CO2 emissions of just 94 g/km to the turbocharged T5 petrol engine with 254 hp and acceleration from 0 to 100 km/h in 6.7 seconds. All engine versions feature start-stop and braking energy regeneration, no matter whether they are fitted with a manual or automatic gearbox. "The all-new V40 wraps you in a super-comfortable cockpit with outstanding ergonomics and technology that make you feel informed, focused and relaxed. This driver-centric approach is what modern Volvos are all about," says Stefan Jacoby. The all-new Volvo V40 features a class-leading safety and driver support package, including Volvo Car Corporation's groundbreaking Pedestrian Detection with Full Auto Brake and several other new features. Among the new features are a world-first pedestrian airbag, Lane Keeping Aid with haptic auto steering, and an ingenious Park Assist Pilot that makes parallel parking easy. The City Safety low-speed collision avoidance system has been further developed and it now operates at speeds up to 50 km/h. 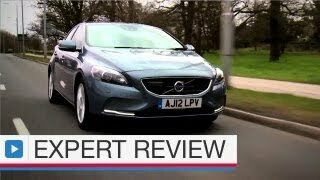 "With this class-leading safety package, including enhanced focus on pedestrian protection, the all-new V40 aims for a full star rating in the new, sharpened 2012 Euro NCAP safety tests." The car will be revealed at a press conference at the Geneva Motor Show in March 2012. Production of the all-new Volvo V40 starts in May 2012. The car will be built in Volvo Car Corporation's plant in Ghent, Belgium. "The all-new V40 makes an instant impression with a dramatic design that stands out from the crowd. And what you see is what you get. The car boasts sharpened features and characteristics from larger Volvos - wrapped in a sleek, compact package. The car also has so many new features that it has an exceptional "density". It has pretty much everything," says Håkan Abrahamsson.